Custom Half-fold brochure. Full color printing on front and back, folded to 5 1/2 " x 8 1/2". 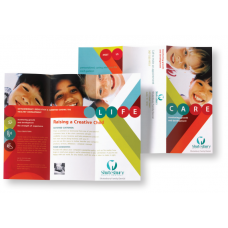 Customer must provide a digital copy of the brochure. Folded Size: 5 1/2 " x 8 1/2"
Flat Size: 11 x 8 1/2"
Once your order is completed you will get to approve the final product and make changes before befor..